Deafening drums, sky-towering stilt-walkers and heart-rending Broadway numbers exhilarated the Reed community on April 20 at the Arlene Schnitzer Concert Hall on the 20th anniversary of the Gray Fund. Since its establishment in 1992, the Gray Fund has brought together students, faculty, and staff in a range of activities—from hot air balloon rides, to sailing down the Columbia River, to attending the Oregon Shakespeare Festival. 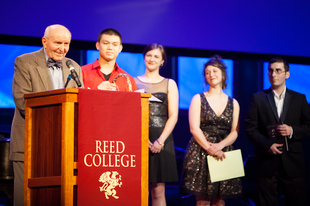 Events are free of charge and substance-free, allowing all members of the Reed community to participate. It has been 20 years since Betty Gray gave $2,000,000 to Reed so that the students, in her husband's words, "could have some fun." Her generosity was celebrated in style at the Schnitz as part of Reed's ongoing Centennial. The revelries started off with a bang—literally—when MarchFourth, the boisterous Portland marching band, started playing in the commons quad. They led students in a parade across campus to Eliot Circle, where students boarded yellow school buses to go downtown to the Schnitz and to get first pick of the seats in the auditorium. We extend our middle fingers to the rankings of U.S. News and World Report. Award-winning Native American writer Sherman Alexie came next, and entertained the audience with his jokes on the ignorance of white society towards people of color. The evening took a different turn when Do Jump Extremely Physical Theater, founded by Robin Lane '75, came on, performing gravity-defying acts on ropes and with the diabolo (also known as the devil on two sticks). The Portland Cello Project wowed the Reed community with a bewitching rendition of the Duke Ellington/Juan Tizol classic "Caravan." The Cello Project's setup was six cellos, playing with various wind and percussion instruments. The most popular collaboration was definitely with the original Dreamgirl Jennifer Holliday, who captivated the audience with her Broadway hit, "And I Am Telling You I'm not Going." The woman who made the incredible night possible, the late Betty Gray, was then honored. Her husband, trustee emeritus John Gray, appeared on stage and was presented with a basket filled with hundreds of thank-you cards from students and a program from the event signed by all the performers. Reedies also thanked the Gray family through a montage of candid videos. As a student, I had the good fortune to participate in many of the Gray Fund's activities. Reed would not have been the same without it. I am extremely grateful for the Gray family's immense generosity and for the Gray Fund Committee for all their efforts through the years.